meeting your fitness goals. Our online scheduler allows you to create your own convenient schedule. We offer a variety of reasonably priced packages options to provide you with the maximum value. SoFit offers one-on-one personal training, small group (2 persons) training, and group training for 3 or more people. SoFit also offers classes for preteens and teens. YouthFit consists of small group training aimed for preteens. TeenFit classes are targeting 13 to 18 year olds. The classes provide a fun, positive atmosphere that encourages children to be active and develop better overall fitness. The modifiable workouts and scaleable exercises translate into improved physical form and performance regardless of athletic ability. Classes are after school M/W/F (YouthFit) and T/Th at 4:30pm and Sat at 12pm (TeenFit). James Davis, a Certified Personal Trainer, is the head of the Club’s Personal Training program. No matter how large or small your objectives are, he can design a program that fits your specific needs. James has a degree in Nutrition Science and recommends a combination of healthy eating and exercise for long term health and well-being. James has experience with Boot Camp, High Intensity Interval Training (HIIT), Indoor Cycling, TRX, Yoga, Step Aerobics, and AbSolutions. He is an American College of Sports Medicine Certified Personal Trainer, Certified Group Exercise Instructor, Aerobics and Fitness Association of America Certified Yoga Instructor, Certified Pilates Instructor, and is American Red Cross Adult First Aid/CPR/AED certified. James Davis is an excellent trainer. He is incredibly knowledgeable and committed, and he creates a friendly, supportive, and dynamic training environment. James is constantly increasing his own knowledge base and passing that information on, and my awareness of my posture and alignment has increased enormously which has decreased a lot of the daily tightness and stiffness that I struggled with. Working with James, I have increased strength, endurance, flexibility, and changed my body composition in record time. He has paced workouts so that I’ve gained in stability and coordination at the same time as strength and endurance so that I am learning to move my body in a whole new way as my fitness level increases. James really cares about helping me meet my personal goals in the present, but he also designs fitness plans that will keep me strong and mobile far into the future. Working with James is the best investment for my health and well-being that I have ever made. This is my new motto. James Davis put together a training program for me to accomplish my goals of getting an outstanding score on a military physical fitness test. I started with being able to do 45 sit ups in two minutes and 27 pushups prior to training with James. During the physical readiness test (PRT), I was able to complete 101 sit ups in 1 minute.45 seconds and 50 pushups in 60 seconds. I crushed my goals and got an overall score of outstanding! This is all because of James. I trained for years on my own but without the consistency and motivation James provided, I would have been unable to accomplish them. I highly recommend James Davis as a personal trainer to accomplish your fitness goal – whatever it is, he will help you reach it! James is extremely knowledgeable and unfailingly professional. As a physician, I am impressed with his mastery of anatomy and physiology. As a mother of three, I am grateful for his humor and cheerful energy. He’s reliable, flexible, and a great communicator. Not only has my overall physical health improved, he’s helped me pinpoint areas of weakness and strengthen them so I can pursue other sports to a higher level as well. I feel so fortunate to have found him! I have been working with James since March 2016 and I find him to be extremely professional, motivating, and knowledgable. James was able to help me correct an underlying muscle weakness that was causing significant hip pain. Without his expertise, this weakness would have likely gone unnoticed. Since working with James, I have noticed a drastic improvement in my mobility and muscle definition. He is always changing the workouts to make them challenging yet fun, and tailored to me. 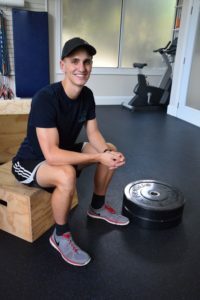 James is an asset to Southern Village and I strongly recommend him to anyone who is looking to improve their fitness and strength. This is the first time in my life that I have ever worked out with a trainer and he has exceeded my expectation. I genuinely look forward to workouts, and I’ve never been able to say that! For the first time in my life am I regularly working out, and it’s entirely because of the personal training with James. 2-3 times a week I head over to the club with my workout buddy from the neighborhood and James pushes us through a challenging but fun workout. It’s become part of our routine and I actually look forward to our sessions! I know I wouldn’t be heading out in the cold/rain, etc. if I didn’t have the accountability of people waiting for me for our session…that accountability seems to be the only thing that motivates me! My daughter has been doing the Kidfit program with James since he started it. She’s not a real active kid, typically, and wasn’t real interested in the beginning. But now that she’s seen personal progress and increased strength/fitness, she’s ready to go. She comes back from each session eager to tell me how many more push-ups or pull-ups she can do than in the past. James works well with the kids and makes sure that they focus on doing their personal best and not necessarily competing with each other. My son loves his weekly training sessions with James. He always leaves sweaty and refreshed and keeps wanting to come back. James is super resourceful and creative and works hard to cater the training to my 10 year old’s interests. They play jeopardy, Harry Potter Trivia, and other games which keep their sessions fun and engaging. Together we set goals at the start of our training package, like work on endurance and hand/eye coordination. James sneaks these skills into their sessions and we can definitely see the results at home. He is an invaluable asset to our community! Thanks, James! James is awesome. He has helped me so much with my personal fitness goals. He doesn’t just focus on building muscle but also increasing strength and flexibility. I see him two times a week for an hour each time and I’m so glad I’ve built these healthy habits into my monthly schedule. There is no substitute for living your right life and James is helping me do that. Not to mention he’s just a great guy who is super enthusiastic about everything he knows that can help people be fit for life. And it’s so convenient to visit him right in the Southern Village clubhouse! – I have had my personal bests! James kept track and documented them so it was no extra work for me. – I have no more pain! – I have been gaining muscle, losing inches and able to eat way more than I did before I was working out with James even though I was active. Why is JAMES DAVIS the absolute best personal trainer I have ever met? – Personality: He is always positive, a great listener and encourages me to improve! – Knowledge: incredibly smart and able to communicate very well. He is formally educated in nuclear engineering science and physical training. He continues to improve his knowledge by self-learning and his personal library is quite impressive and diverse. My experience with James as a personal trainer has been terrific. I’ve worked with several trainers & gone through cardiac rehab due to a stroke. James is exceptional in that he is able to tailor the exercises to the specific needs of the client. He is also systematic about charting my improvements! Thanks, James. When I signed up for a Spartan race last year, James became my coach, cheerleader, and teammate all rolled into one. He researched obstacles, identified areas I needed extra training in, and even designed new challenges to help me prepare. I went into the race with confidence, and managed to surmount surprise obstacles I hadn’t trained for because I was strong and I knew it. Even during the intensity of training, James’s approach was always easygoing and supportive. I feel incredibly fortunate to have found him! It is our privilege to acknowledge and applaud James Davis. We moved to Southern Village March of 2016. I immediately needed to find a personal trainer for my husband Ron who suffered a serious stroke seven years ago. We have been so very pleasantly pleased with the amount of professional care that James has given to Ron’s disabilities. The physical improvement is very evident, balance, extension of right hand and arm,and most importantly, attention to his self esteem. James is a cheerleader for any and all ages bringing out the best in everyone he works with. James has made this move an exceptional experience for both my husband and myself. We’re very grateful to have such a positive force in our lives. When I started working out with James, I was having hip pain and foot pain, I was out of shape and was feeling overwhelmed about where to start to get back into shape. I was looking for something convenient and effective. From our very first interaction, James was positive, motivating and helpful and that’s how he has been ever since! Through his guidance and exercise plan, my hip pain is much better, my foot pain was gone within a month, my muscles are much more toned and I am so much stronger. James is extremely knowledgeable and goes above and beyond to answer questions about fitness and exercise. I love that he keeps track of my work outs and progress, and he frequently reminds me of how much I have improved. I cannot say enough good things about James. I completely trust his judgment when it comes to my fitness. He also has a nutrition background which is very helpful. I have so much fun working out with him! I highly recommend him to anyone who is looking to get in shape. This is the best investment I’ve made in a long time! I’ve been taking the Teen Fit classes for only a couple weeks now and already I feel stronger and more prepared for my upcoming soccer season. This program has really helped me to exercise more and do more for my endurance and core. I wanted to let you know that William has really enjoyed the Teen Fit program with James. William has enjoyed every class and has come home with sore muscles, the sign of progress, often. It seems that James is able to push the kids to work hard in a very positive way. William can easily measure his progress by his decreasing times in running exercises and his increasing weights in other drills. I feel that Teen fit is a great way to improve overall fitness and think James is great.